This immense hospital complex was designed by architect Heino Schmieden and built in 1898 in the Southwest portion of Berlin near the city of Potsdam. 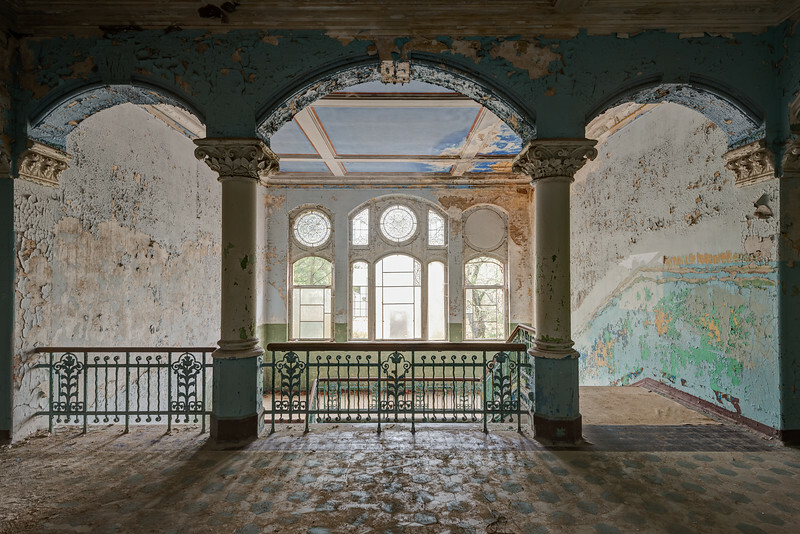 Originally built as a tuberculosis sanatorium this massive complex was converted into a military hospital during World War I by the German Imperial Army. As mentioned above a young Corporal Adolph Hitler was treated at this hospital in October of 1916 for a leg wound received from British shelling during the Battle of Somme. In 1945, after the defeat of Nazi Germany, the German nation was divided in two. At this point in history the USSR took control of the facility turning it into a Soviet military hospital. Even after the reunification of Germany on October 3, 1990 the Soviet Army remained in control of the hospital until 1995. Following the Soviet withdrawal, attempts were made to privatize the complex, but they were not entirely successful. Some sections of the hospital remain in operation as a neurological rehabilitation center and as a center for research and care for victims of Parkinsons disease. The remainder of the complex, including the surgery, the psychiatric ward, and a rifle range, was abandoned in 2000. As of 2007, none of the abandoned hospital buildings or the surrounding area were secured, giving the area the feel of a ghost town… (Source: wikipedia.org).